Report your experience with Blue Cross below. Is Blue-Cross increasing your premiums every year? 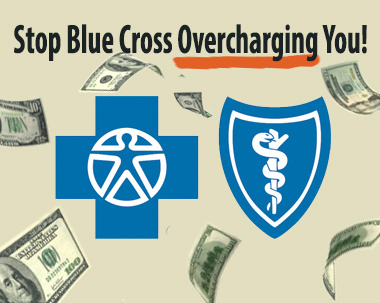 Blue Cross, as a non-profit, should be lowering your premiums instead of over-paying their own staff millions! We believe that as a non-profit, Blue Cross should be using their excess profits to lower the cost of your yearly premiums instead of needlessly charging you more each month. We have received a ton of complaints over the last few weeks that Blue Cross members are upset that their Blue Cross “premiums” are increasing from year to year despite Blue Cross making millions more in profit each year as a “non-profit.” Blue Cross benefits as being a non-profit in many ways including getting tax breaks in their Federal, State, and local taxes. As a non-profit though that means that they cannot reap excessive profits at your expense. Consumers have reported to us that Blue Cross has excessive profits in the hundred million figure and yet we have yet to speak with anyone whose “premiums” have been lowered. As a non-profit, Blue Cross has a duty to it’s paying members to work on your behalf and not to take advantage of you. Many of the people who contacted us are irate at their premiums increasing despite the CEOs of Blue Cross receiving millions in bonuses as a non-profit! We are looking to file a class action against Blue Cross to force Blue Cross to respect their paying customers and to treat their corporation as the “non-profit” that they are. Voice your opinion in the form above. By you reporting your experiences in the form above, the more we can better understand and use this to help force Blue Cross Blue Shield lower the premiums for everyone. We’re looking forward to hearing from you. Report your experience above.